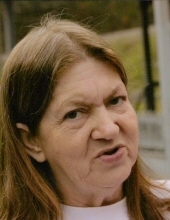 WILMA LEE (HURLEY) WYATT, 67 years of age of Hurley, VA passed away Friday, April 5, 2019 at the Pikeville Medical Center. Born in Wyoming, WV she was the daughter of the late Nathan and Truler Bee (Justice) McGraw. She was a loving wife, mother, grandmother, great-grandmother, LPN at Heritage Hall, worked for Grundy Ambulance Service and Volunteered with Knox Creek Ambulance Service. She loved spending time with her grandchildren, riding side by side, gardening and growing flowers. In addition to her parents, she was preceded in death by her first husband Fred Matney, 1977; 1-Sister: Carolyn Keene; 1-Brother: Jerry Hurley. Those left to cherish her memory include her husband that she has been together with for 37 years, Harold Kenneth Wyatt, Hurley, VA; 6-Children: Fred (Kelly Bailey) Matney, Hurley, VA, Hobert Lee Matney (Christy) Hurley, VA, Vanessa Ann Matney Keen (Thomas Michael Blankenship) Breaks, VA, Gary Dean Matney, Hurley, VA, Jessica Lynn (Chris) Burks, Hurley, VA, Kenneth Ray Wyatt, Hurley, VA; Grandchildren: Freddie Ray Matney Jr., Adrianne Matney Hankins, Kenzie Hankins, Taylor Rain Matney, Hobert Lee Matney Jr., Kenton Chase Matney, Kira Truler Aubrey Matney, Whitney Paige Keen, Asheli Dawn Keen Deel, Austin Michael Blankenship, Nate Lee Blankenship, Savannah Matney, Tyler Matney, Garrett McClanahan Matney, Alexis Mckenzie Burks, Elizabeth Raylee Wyatt; 8-Great-Grandchildren; 1-Brother and 2-Sisters. She is also survived by several nieces, nephews and a host of special friends. Funeral Services for WILMA LEE (HURLEY) WYATT will be conducted Tuesday, April 9, 2019 at 11:00 AM at the Bethel Baptist Church with Paul Rife and Frank Matney officiating. Burial to follow in the Wyatt Matney Family Cemetery on Mountain Laurel. Friends may call at the Bethel Baptist Church Sunday and Monday evenings at 6:00 PM with services at 7:00 PM. Honorary Pallbearers will be the Staff of Heritage Hall Nursing Home. Grundy Funeral Home of Grundy, VA is honored to serve the family of WILMA LEE (HURLEY) WYATT. To plant a tree in memory of Wilma Wyatt, please visit our Tribute Store. "Email Address" would like to share the life celebration of Wilma Wyatt. Click on the "link" to go to share a favorite memory or leave a condolence message for the family.